The San Diego Legion welcomed the Utah Warriors to Southern California to end week two of the 2018 season. The Legion were able to take better advantage of Utah's mistake on their way to a win. Utah had some good moments, but will be kicking themselves for their mistakes. The Legion got the scoring started on the day. After putting early pressure on the Warriors, the Legion were able to maul their way down passed the five meter line. After a couple of phases were stopped short, Sione Tu'ihalamaka was able to make his way over for the try. Kurt Morath had a shot to get the Warriors on the board, but his penalty kick was just wide. 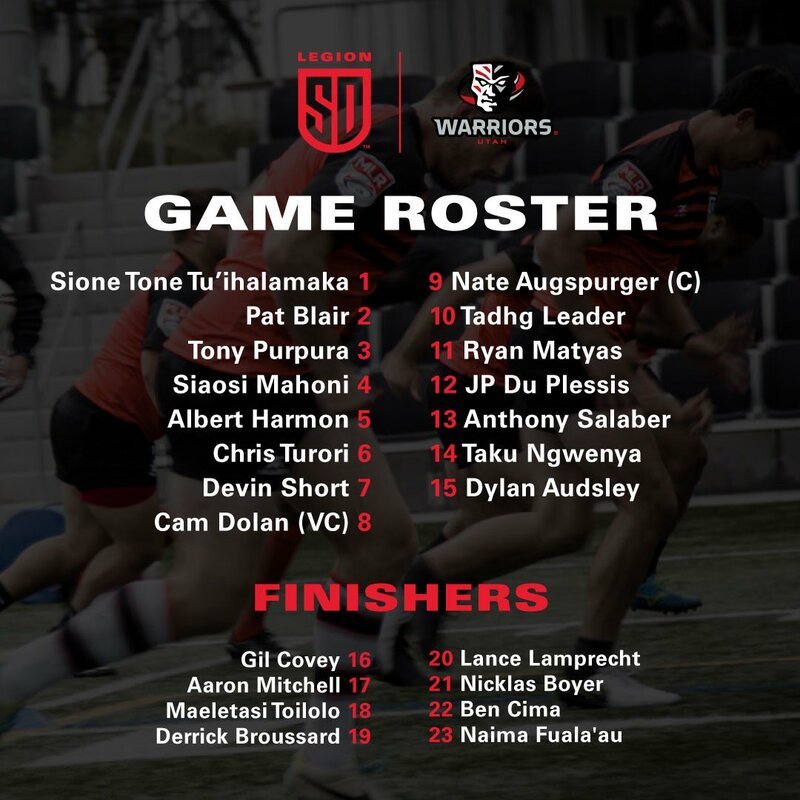 After being overpowered in the scrum last week against Seattle, the Legion did the same thing to the Warriors in the first scrum of the match. Tony Purpura added another forward try for the Legion. The Legion went for the lineout after the scrum penalty and mauled their way over the try line. Joseph Nicholls got Utah on the board. After multiple pick and go phases for the Warriors, Nicholls was able to find a gap through the Legion defense for the try. The Warriors used finesse instead of power for their second try. After using multiple pick and go phases, the Warriors were held up and were given a five meter scrum. 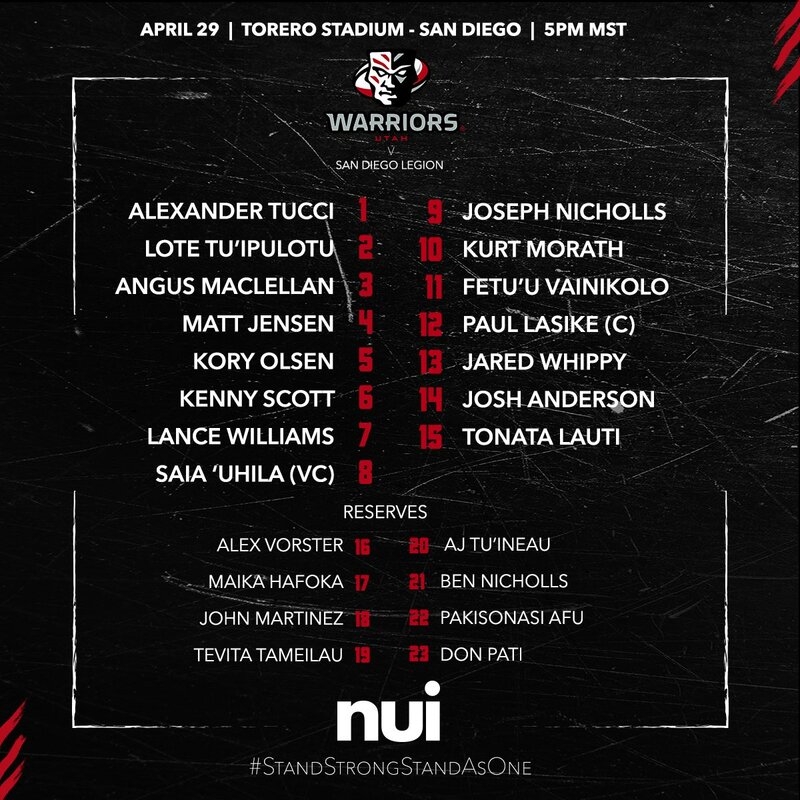 Instead of using their power to force the Legion back, the Warriors played the scrum quickly and Saia 'Uhila picked the ball from the back of the scrum and broke two tackles on his way to a try. Devin Short got the Legion their lead back five minutes after the 40 minute mark with a controversial try. The Utah Warriors were able to hold the Legion short of the line during numerous phases. The Legion eventually went wide to Short who was able to dot down before he was pushed out of bounds. Photographic evidence has emerged to show he stepped into touch before dotting down. Tadhg Leader missed the conversion and the Legion held a three point lead at half time 17-14. Good rugby from both teams in the first half. Small mistakes kept the teams from gaining much traction. Both teams had multiple possessions that they didn't score on because of small mistakes. Both teams also let their opponent's possessions continue with silly penalties. Both the Legion and Warriors had opportunities to advance the ball taken away due to miscommunication. They each had a line break and looked to offload the ball to the support, but the end result was a knock on. The Legion scrum started to fall apart in the second half. San Diego looked like they hadn't learned a thing from the Seattle match. Kurt Morath had shot to tie it with a penalty kick earned from a scrum penalty but pushed it to the left. The Legion had a box kick partially blocked, but JP Du Plessis was their to knock it back into Anthony Salaber hands who ran nearly 50 meters for the try. The Legion's defense was really helped by the fact that the Warriors were playing flat ball all day. Utah didn't really have anyone running onto the pass. Where the Warriors started excelling in the scrum, they had issues with their lineouts all day. They either threw over the lineout or threw before they were ready. Kurt Morath was able to bring the Warriors to within a converted try of San Diego after a penalty kick. Ryan Matyas showed up in a big way after being quiet for most of the match. Tadhg Leader found some open space with a cross field kick and Matyas brought it out of the air and dotted down for the try. The second Nicholls brother, Ben, added a try for the Warriors. The Legion were called for a scrum penalty and Ben quick tapped and broke through the Legion defense for the try. Utah had some last minute opportunities to score, but squandered them away. They were able to turn the ball over from San Diego multiple times, but kept committing knock ons costing them the game. The Warriors squandered numerous opportunities to score. They made numerous handling errors that cost them those opportunities. Utah will also feel done in after photographic evidence emerged that showed Devin Short stepped into touch before scoring at the end of the first half. San Diego showed during the first half that they can make adjustments week to week. Their key will be to sustain them, as they regressed in the second half. The Legion also made numerous errors that cost them points, but they were able to take better advantage of Utah's mistakes. The Legion are on a short week, as they host the Houston Sabercats in the CBS Sports Game of the Week on Friday, May 4th. Utah returns next Saturday, May 5th, as they host the Glendale Raptors.